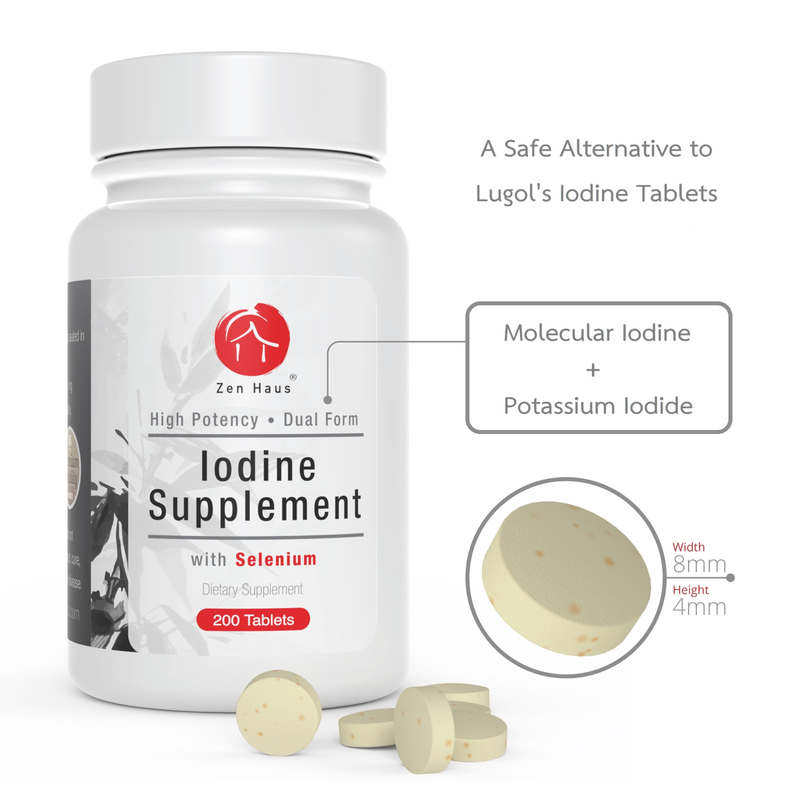 The Zen Haus Iodine Supplement is available on Shopify, eBay, and Amazon. 3 mg of Molecular Iodine (I2). I2 can help balance stomach bacteria. Read Iodine & Iodides to understand how this formula is in part based on the balance of iodine forms in edible seaweeds. 12.7 mg of Potassium Iodide (KI). KI is the form of iodine used in the body. It is safe and effective for oral iodine supplementation and will not cause digestive issues or iodism. See our four part article entitled Why KI? which why KI is the best form for total body supplementation. Selenium is a trace mineral that works in conjunction with iodine and is crucial for helping the body recycle iodine. It maximizes the iodine active thyroid hormone (T3) conversion. Selenium helps the body produce glutathione which prevents damage to important cellular components, build the immune system and support the heart. It is extremely beneficial with removing mercury and other heavy metals from the body. Chromium is a component of a number of enzymes that release energy from cells. It is an important co-nutrient because it is required for proper receptor functioning necessary for nutrient metabolism. Chromium helps to maintain healthy blood sugar levels and is a popular choice for weight loss support formulas. L-Theanine is an amino acid found most commonly in green tea leaves. The traditional therapeutic use of green tea dates back to China 4,700 years ago. 20 mg is about of one cup of green tea. Promotes both calmness and alertness while protecting against cognitive decline over time. L-Theanine will help smooth out the stimulatory effects of iodine. Even more so for coffee drinkers.